In spring beautiful Dandelions pop up all around us and these little beauties are a medicinal powerhouse. 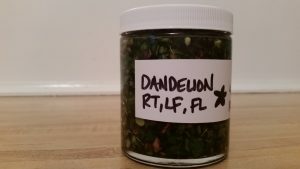 Pick the leaves and toss them in salads or make fresh Dandelion tincture from the whole plant. So go outside to a place you're sure hasn't been sprayed with harmful pesticides and pick those dandelions! Give an offering, sing a song or say a prayer thanking the plant spirit for the wonderful health benefits it's about to bestow on you, your family and friends. 1. Gather the whole Dandelion plant including the roots, Run them under water to remove any excess dirt. 3. Add the plant material to a jar, pack it in tightly. 4. Cover the plant in 100 proof Vodka, Everclear or pure grain alcohol. If you have 80 proof, you can use that too. Use a chop stick to poke around and make sure all plant material is covered and submerged in the alcohol. Lightly tap the jar on a hard surface to remove any bubbles. 5. Cover the jar and label it. Be sure to include the plant name, parts used (root, leaf and flower), date, alcohol type and proof, and where you harvested the plant from. 6. Share the jar as often as possible and let sit for at least 6 weeks. 8. Add the liquid to a freshly cleaned, dark colored bottle and cover tightly. Store in a cool, dark place and the tincture will last for years.